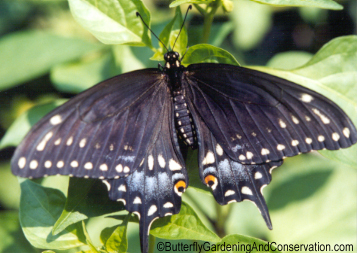 Black Swallowtails are a fairly common but very pretty butterfly with a wingspan of about a 2.5 to 4 inches wide. 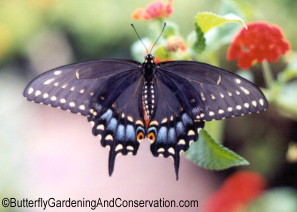 They are easy to attract to host plants to lay eggs, and the caterpillars are easy to raise also. I have had most success with fennel and parsley, (both curley and flat parsley), but have also had females lay eggs on Rue - Ruta graveolens. Parsley, fennel and dill can be bought as plants from almost any nursery, although many do not keep the plants in stock all summer long. These plants are not easy to grow from seed, so my advice is to buy the plants. You can even transplant them into a little bit bigger pot and grow them in that rather than plant them in the ground. A Black Swallowtail Butterfly Egg. Black Swallowtail butterfly eggs are a very pale, almost white color. They are spherical (ball like) and the female will lay them on both the undersides and tops of the plant leaves. It takes around 3-5 days for the eggs to hatch. Longer if the weather is cooler. When the eggs are close to hatching they will turn to a darker color. The dark color is the actual caterpillar growing inside. The caterpillars chew their way out of the egg. After they hatch they eat what is left of the egg. When they first hatch the Black Swallowtwail caterpillars are only around 2mm long, and are black with a white band around their middle. Unfortunately, my pictures of first instar Black Swallowtails are not clear enough to make out all these details. First instar Black Swallowtail caterpillar. White band around middle is not visible in this picture. A first or second instar caterpillar right after molting. Notice the molted skin laying behind it. The red/orange spikes showed up more brightly right after it molted, and were not as visible after a while. It's head capsule is still light colored in this picture too. This picture was magnified when scanning, the caterpillar is only about 4mm long. This the same caterpillar as in the previous picture, but not magnified. You can see the spikes are not as brightly colored now, and the head capsule has turned to the normal color too. 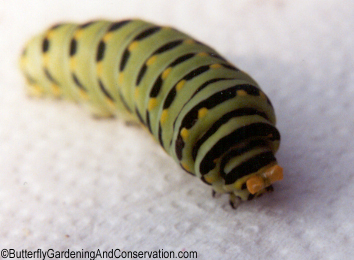 Black Swallowtail caterpillars change their appearance quite a bit as they grow. Second and third instar caterpillars look a lot alike, both are black with red/orange spikes, with the white band around their middle. Size range for 2nd instar is about 4.5 to 8 mm, for 3rd instar - 8mm to 13mm (1.3cm). 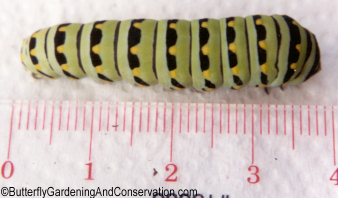 A third instar Black Swallowtail caterpillar. 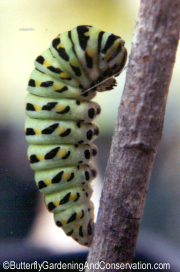 A third instar caterpillar viewed from the top. Image was magnified when scanned in so more detail would show. Fourth instar caterpillar look very different from the 2nd and 3rd instar. It has black and white/ pale greenish bands, or stripes all along its body and yellow spots. 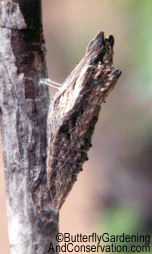 On early fourth instar, the middle white band can still be seen, but it fades away as the caterpillar grows and stretches its skin. Their size ranges from around 1.3 cm to 2.5 or so cm. Fourth instar caterpillar on fennel stem. Another 4th instar. Picture was magnified a little so more detail could be seen. 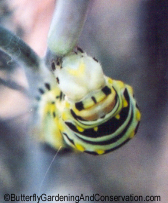 Fifth instar caterpillars have green and black bands with yellow spots along the black bands. They grow to about 4 cm before pupating. 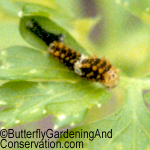 This is a picture of a 5th instar caterpillar right after it molted. Notice the dead skin laying behind it, and its face/head capsule is still light colored. This is the same caterpillar as the previous picture, only viewed from the front. You can see how its face/head capsule is much lighter here better than in the last picture. Caterpillars usually rest for a little while after molting while the pigments in their head capsules forms. Then they eat their dead skin they just molted, as this one is doing. The usual color pattern of the head capsule is visible in this picture too. 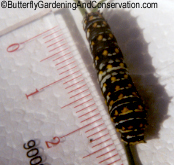 This is a fully grown Black Swallowtail caterpillar, measuring close to 4 cm. 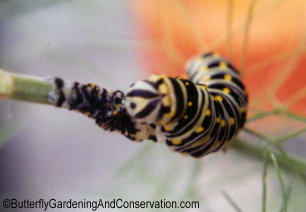 Swallowtail caterpillars have an orange/red fleshy forked organ called an osmetrium that they stick out when distubed to scare off predators. Osmetria give off a bad smell when stuck out - from two chemicals released from it - isobutyric and 2-methyl-butyric. When Black Swallowtail caterpillars are ready to pupate they tend to wander quite a distance from the plant they were eating. Before they wander off however, they defecate/poop one last time. They empty out their whole digestive tract so this last poop/frass is kind of runny or diarrhea like. This caterpillar has itself attached to a stick to pupate. touching the stick (except at its last segment). around by its face/head capsule. 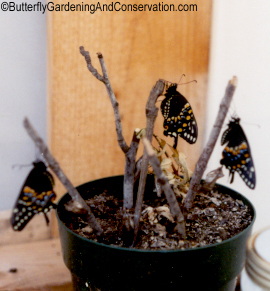 Once they find a place to pupate, they will stay in that spot for a while without moving very much. Sometimes for as long as 24 hrs. Eventually they spin silk thread to attach themselves to the object they decided to pupate on. After another 24 hours or so (depending upon the temperature) they molt one last time. After this molt they are no longer a caterpillar/larva, but a pupa that has formed a chrysalis. 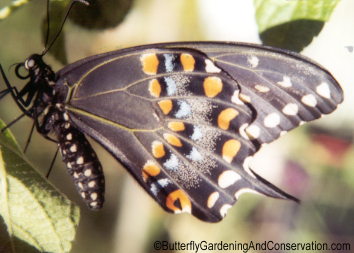 Black Swallowtail chrysalids can be any one of three colors. The most common is a dark brown color, that makes it look like part of a stick. Less common are a green color and a light brown. 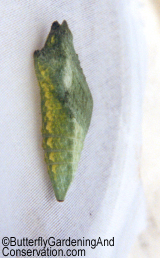 This green colored chrysalis became detached from what it was pupating on (I don't remember how now). These three picture show it from different sides. I don't like the way the color turned out in these photographs though, details in the picture don't show up too clearly either. They are much prettier than they look here. The light brown ones (which I don't have a picture of) also have yellow on them like the green ones. After pupating for around 9-11 days, longer if its cooler out, or if it pupates over the winter, the adult butterfly emerges from its chysalis. A picture of a male is on the top of this page. Compare its color pattern to the females below (and to the side). Notice that the male has more yellow and less blue. You can see some individual color pattern differences between the females too. 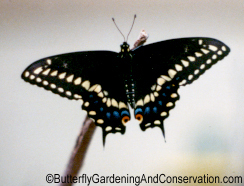 Adult Black Swallowtail from the side with wings closed. A group a freshly emerge adults. Notice the way they are hanging kind of upside down. All butterflies do this right after emerging from the chrysalis to help get fluids down into their wings so they can fly. On rare occasions I have some Black Swallowtail caterpillars that develop a little differently. I call them 'black form' caterpillars. I don't know what they are officially called, or if they are called anything. From my own observations, I have found that these continue to look more like a 3rd instar when they are at their 4th instar stage. Even the white band around their middle is still somewhat visible. Below are some pictures from this past summer. This is a 5th instar that has more black than usual. I've seen both the regular and the 'black form' caterpillars sometimes colored this way by their 5th instar. Notice that the yellow spots are now nearly perfectly round and completely separated from the green/white bands. 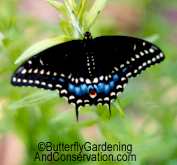 Great items with Black Swallowtail images on them available now from my Cafepress store! This design available on t-shirts, tote bags, mugs, magnets, framed tiles, coasters, and even a light switch cover! This image is available on t-shirts, mugs, and magnets! These images available on t-shirts, tote bags, framed tiles, coasters, mugs, and magnets!